The ‘Miss Christin’, a 65’ passenger ferry operated by the Potomac Riverboat Company was coated with HullSpeed 3000-Series in early February. The Alexandria based boat was hauled for its regular coast guard inspection and will be receiving routine maintenance including new bottom paint. The Potomac Riverboat Co. which operates more than eight vessels was excited to try a new innovative bottom paint that could potentially be a simple cost saving tool. A HullSpeed application over their traditional barrier coat could provide significant improvements in vessel efficiency and hull maintenance. SARATOGA SPRINGS – Greenfield Manufacturing Inc., maker of a low-friction boat coating, has found significant energy savings in the use of its product, thanks in part to funding from the New York State Energy Research and Development Authority (NYSERDA). Greenfield Manufacturing Inc., which has been working with NYSERDA since 2009, has developed HullSpeed, a high-tech coating that can be applied like paint to boat hulls. Companies using HullSpeed report improved fuel economy of up to 8.5 percent, while at the same time increasing boat speed, when compared to operations before the coating was applied. 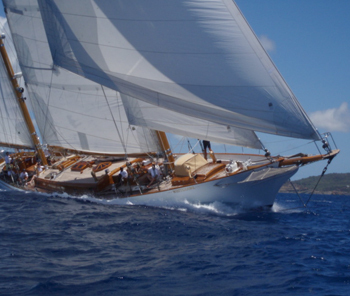 Belle Aventure, a 1929 William Fife design sailing yacht was coated with HullSpeed 3000-Series and HullSpeed 101 primer in March 2012. The ‘green’ performance coating system was applied during routine maintenance following several years of modernization refits to make the boat more technologically efficient and retain its near‐original condition. The 94’ LOA Belle Aventure took first place in the “Professionally Restored Sailboat” category during the 2010 Concours d’Elegance at the 19th Annual Wooden Boat Show hosted by Mystic Seaport in Mystic, Connecticut. Prior to the event, Belle Aventure had undergone a major restoration and refitting at Boothbay Harbor Shipyard, in Boothbay Harbor, Maine.